If your house catches fire and you flee into the night in just your pajamas, you can likely find shelter at a neighbor's or a local hotel. If your boat catches fire at sea, your options are far more limited. Being prepared might help put out the fire but that doesn't mean you're out of danger as the fire may have left you adrift with damaged engines, no power for a radio, or burned sails. Even worse the boat could now be sinking. Hopefully another boat is nearby or you'll need to swim to land, provided you are close enough to know where it is and the current doesn't prevent you from getting to it. Once in the water you can't count on a dolphin to keep you afloat. 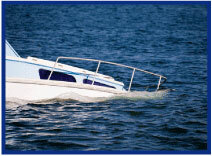 Prepare a "to-go' bag for worst-case scenarios kept in a readily available location regardless of the size of the boat. Visual Distress Signals - flags, flares, smoke, etc. AIG's Private Client Program and is available to registered Big "I" Markets agents in all states. Ride the waves over to Big "I" Markets and click on Affluent Program - New Business to learn more! 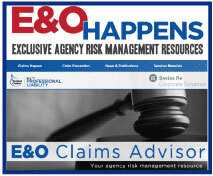 Knowing the common insurance agency E&O claims, understanding the root causes of E&O losses and implementing change can go a long way to eliminate E&O exposure in your agency. Being informed can point your agency in the right direction of knowing how to proactively avoid issues for your agency. In general, E&O losses occur because of inadequate training and education, poor risk identification and analysis, lack of uniform practices and procedures, inappropriate organizational structure, lack of compliance with office practices and procedures, time constraints and/or chronic backlog. As a Big "I" member you can get information on these topics through the Big "I" Professional Liability risk management web site at www.iiaba.net/EOHappens. Log in with the same credentials you use to access Big "I" Markets, and click on the "Claims Happen" tab to access these materials and more. Clients can claim fraud in the final product, misrepresentation, or theft. Third parties can sue if they experience "economic damages" due to the actions of the professional. The cost of defending against such claims can be enough to cripple or close the business even if they win the case, more so if they lose. This exposure requires professional liability coverage such as that offered by CNA through the Connect® program. Coverage highlights include limits of up to $5 million, worldwide coverage, pre-claims assistance, and broad definition of insured person, among others. CNA will defend against claims of alleged and intentional wrongdoing until final adjudication. CNA Small Business currently offers a market for a broad variety of businesses, representing Healthcare, Financial Institutions, Professional Services, Business Services, Technology, Retail, Real Estate, Wholesalers and Manufacturing. Coverage are BOP, Workers Compensation, Commercial Automobile, and Umbrella and Miscellaneous Professional Liability. This market is available in all states except AK & HI. Congratulations to this week's winners - Katrina Willard (FL), Rose Haynes (MD), Linda Gammill (MS), Janet Lackey (OH), & Steve Ward (SC). Congratulations to our agent in Alabama on an Affluent Homeowners Program sale of $18,716 in premium!